Autumn means going back to work, school, university and for many of us, long hours back at a desk. Desk yoga poses may help you to keep up the good work after the relaxation achieved during the summer holidays. Here’s a way to press your own ‘refresh button’! Balance the effects of sitting for seven or eight hours at a stretch with desk yoga poses to relieve stiffness and stress. Naturally, these yoga poses need to be more subtle as depending on your job, your work clothes are unlikely to be workout gear, which may well be restrictive. Deep breathing is a simple yet powerful relaxation technique that can be practised almost anywhere and provides a quick way to reduce tensions. It is also the basis for other relaxation methods and so the ideal starting point. Sit on your chair with your back straight and breathe deeply a few times, a sigh helps too. Then inhale through the nostrils for five counts. Hold your breath for 10 counts. Exhale through the mouth for 10 counts. Repeat five to 10 times. This is a good one to do several times a day to help you feel more refreshed. Many of us hold our stress in our neck and shoulders, so a neck stretch is a good move to do early on in the day (again, you can also do it as a standalone exercise throughout the day if needed). Placing your right hand on your left ear, gently let the weight of your arm bring your head toward your right shoulder, while you reach towards the floor with your left hand. Inhale and exhale for three breaths and try to extend your hand towards the floor. Repeat on the left side. Hips can be particularly tight from sitting all day. Sit up straight in your chair, bring your right leg across to your left with the ankle above your left knee. Gently place your left hand on your right ankle and your right hand on your right knee to feel the stretch in and around your hip joint. Try to open your hips a little more each time by pushing your right knee gently toward the floor. After three breaths, release your right leg to meet your left. Repeat on the left leg. With your hips sat back in your chair and your knees together, inhale and place your left hand on your right knee. As you exhale, engage the lower abdominals and twist with the upper part of your spine, placing your right hand behind your back. Each time you inhale, imagine yourself growing taller, and each time you exhale, see if you can twist a little bit deeper to the right with gentle ease. Repeat on your left side. Some people find a diagram easier to follow than reading instructions, so may find this simple illustration on the NHS website for a three-minute work out useful. You can find more information on yoga styles and retreats on our website. 1. Always let yourself breathe freely while moving. Holding or forcing your breath while moving only creates tension and defeats the purpose of any exercise. 2. Let each move feel comfortable (without pushing or forcing) and check how you can ease more into the movement in a relaxed way, thus allowing more depth and flow. 3. Avoid dropping your head backwards, always lift it up and out of your spine in order to prevent compressing the vertebrae. Instead, reach through the top of your head to lengthen your spine and rotate your head to the side, middle and over to the other side (without dropping your head backwards). If in doubt ask your health care professional. 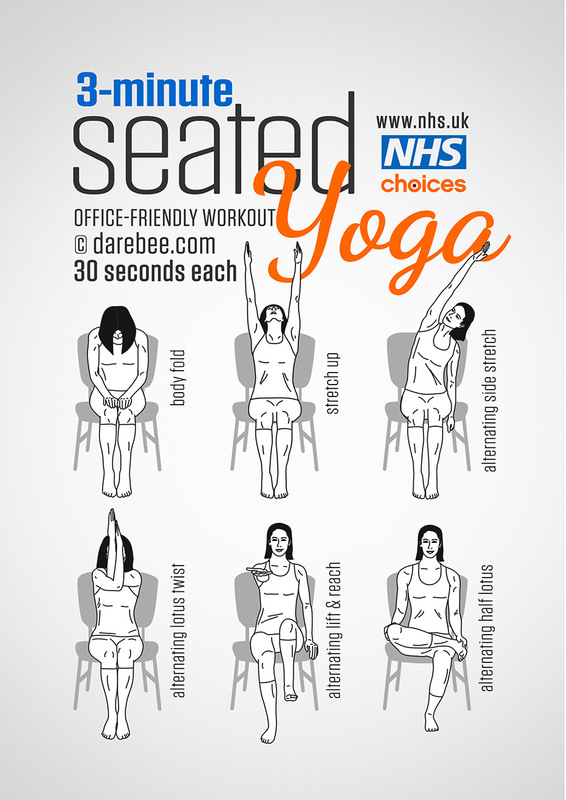 Remember, you can perform the above seated yoga poses as many times as feels comfortable throughout your day without interrupting your working schedule. Who knows, you might even encourage colleagues to do the same… and feel more refreshed and alert at work! The content within this blog is provided for general information only, and should not be treated as a substitute for the advice of your own doctor – this applies especially for pregnant women and teenagers. Neal’s Yard Holidays is not responsible or liable for any actions taken by the reader based on the content of this site, nor for the contents of any external internet sites. Always consult your own health care professional if you are in any way concerned about your health or physical exercises.